Some more of my notable Godzilla collectibles, although not necessarily GvD items. You can see even more by clicking the Boston link at the bottom. I've clearly gone off the deep end now (as I hang my head in shame)... I have a "Ty Classic" Beanie Baby! 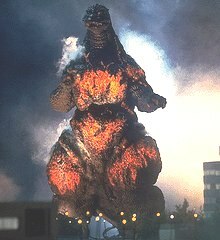 Released in late 2001 for the GMK movie and available only in Japan, it's an official Godzilla. 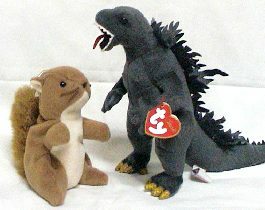 The stuffed animal is about 8" tall, bigger than the regular Beanie Babies (like Dulce's "Nuts the Squirrel"). There's also a version with white eyes, but I like this one better. Isn't it ironic that I left the tag on, where I usually take them off for the vinyl figures? 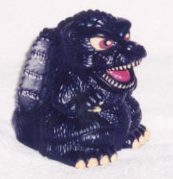 Doesn't Godzilla with his little tongue look so adorable? Talk about a great find!! I found this at a Best Buy store in 1998 for about $20. The Library has lots of movie clips from GvD and all the Heisei movies. Pictures, holograms, and roars of all the monsters can be found in the Museum. There are also printable cards, stickers, and posters. 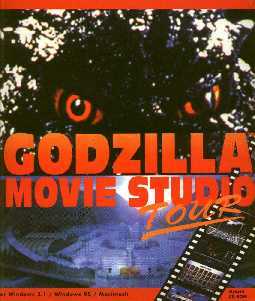 Plus, there's a movie studio where you can edit your own Godzilla film (kind of). This software is no longer in production and can be hard to find. 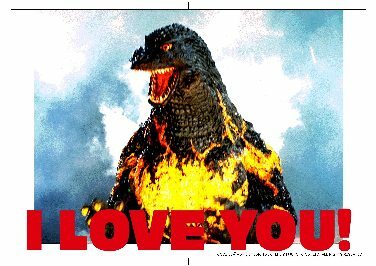 I've used sounds, music, and pictures from it all over my page, including the little Destoroyah and Godzilla icons. Actually, it could be said this CD-Rom built my page in its initial stages. 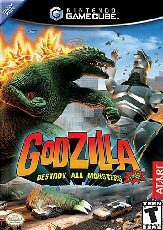 This video game was released in the US in 2002 for the Nintendo Gamecube. 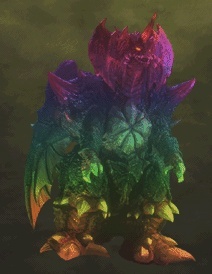 You can actually be Destoroyah and use various attacks like Micro Oxygen Spray, Oxygen Absorber, and Horn Katana. To be this monster, get the cheat code menu by hitting L,B,R then releasing B,R,L in that order. Entering "537084" will unlock Destoroyah. Or you could actually play the game and earn your right to be the monster. I got this game free for evaluation from the company after they reviewed they web site! 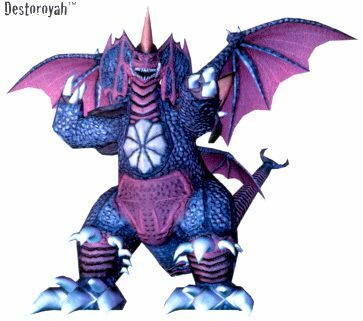 Here is a pic of Destoroyah. 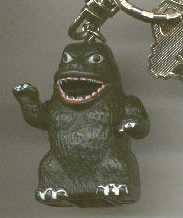 After subtitled videos, this was the first Godzilla item I ordered. Well, Ramonette and Dulce looked at Shirokiya in Hawaii for more Godzilla toys. There was nothing there, not even any G2K toys. Undaunted, they continued their search for a Godzilla item to get me for Christmas. They found this pack of "Made in the USA" party favor loot bags at a dollar store! I found this 4" Yutaka Chokinbako SD piggy bank at Toys n Joys in Aiea, not too far from where I live. Now that I moved to Hawaii, I still haven't found a store quite at the level of Aki Oriental in Omaha. 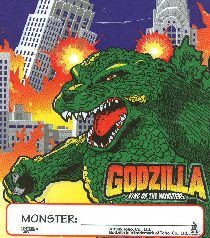 Not that I've had a lot of time to look, but my searches do unearth the occasional Godzilla.